And others (Ireland On Sunday) ) ""
Beautifully written, meticulously researched, immensely enjoyable and, by turns, heartbreaking and uplifting." --Sunday Independent. A truly incredible historical novel set in the beauty of Ireland's dark and tumultuous past. 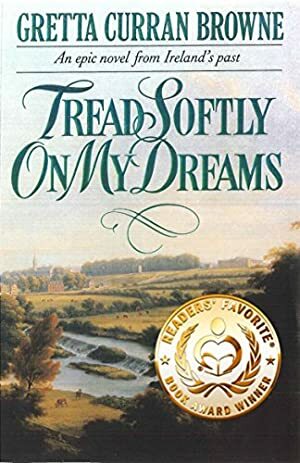 From the very beginning of Tread Softly on My Dreams by Gretta Curran Browne, I was captivated by the rugged beauty of Ireland's mountains and its soft lush valleys. The author's detailed description of each setting enhanced the vision for the story, while each new character increased the intrigue. Every path created provided clarity of the situation, both personal and political, and showed great determined strength of the human spirit to stand firm in the beliefs of a free Ireland, even at the expense of their own lives. I found myself cheering on the hero and heroines of the story, applauding their successes as well as shedding tears at the injustices, brutality, and suffering of the people who simply wanted their freedom. The reader's heart will swell with the love Robert has for Sarah, and the dedication and unspoken love Anne has for Robert. A fantastic read from beginning to end. The Emmets are Protestants, belonging to the elite society of Ireland's ruling class. Born in 1778, Robert Emmet, the youngest son of the State Physician of Ireland, has grown up in the heart of a prosperous and loving family, one of the most respected in Dublin city. From his parents he acquired a deep love of Ireland and a commitment to justice. From his brother Thomas he acquired an understanding of the divisions and inequalities of his country. In the historic year of 1798 Robert's life changed from its charted course to one of rebellion. A brilliant student at Trinity, he casts aside all hopes of a scientific career, all the privileges of his class, to join the United Irishmen - a society dedicated to the union of Protestant and Catholic. But the men in Dublin Castle determined on the continuance of English rule, force him to flee to France. But even as his boat sails away from his beloved homeland, he looks back and knows he will return - to the cause of his country's liberty, and to the beautiful girl he has fallen in love with, Sarah Curran, the daughter of Ireland's most talented lawyer. He returns - and meets Anne Devlin, a passionate and brave Catholic country girl, who becomes his most devoted companion. Set against the background of the beauty of Ireland, the dark clouds of its past, as well as the humour and dreams of its people, this is a passionate and powerful true story of three young people, Robert Emmet, Anne Devlin, and Sarah Curran, drawn together in love, in hope, and tragedy. Log In to track Gretta Curran Browne on eReaderIQ. to be notified each time the price drops on any book by Gretta Curran Browne. to stop tracking Gretta Curran Browne. We started tracking this book on February 27, 2018. The price of this book has changed 19 times in the past 420 days. This lowest price this book has been offered at in the past 90 days is $4.55. The lowest price to date was FREE last reached on July 11, 2018. The highest price to date was $5.99 last reached on March 26, 2019.